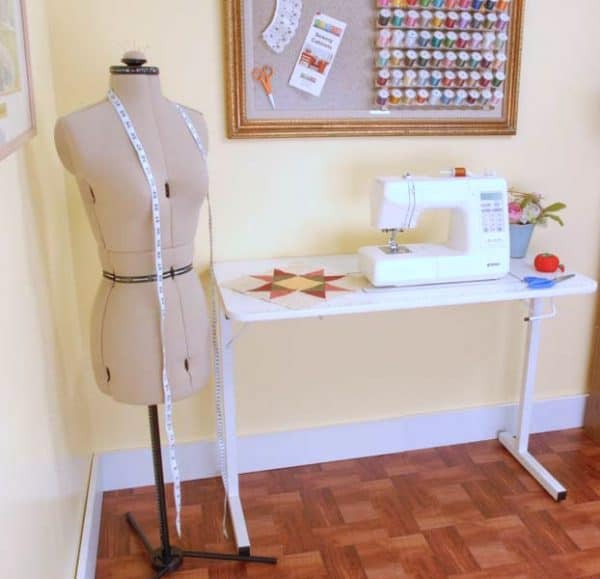 If you are on a budget with limited space then you will love the Gidget I Sewing Table from Arrow. It can be purchased in the $100 range and is very sturdy for the price. It will fit most standard sewing machines and has an opening that raises and lowers. I love that you can purchase a custom insert from Arrow that will fit almost any sewing machine. One of its best features is the steel-locking legs that fold for easy storage. For the price, I consider this one of the best options for both its durability and design. The Gidget I Table will accommodate sewing machines no larger than: 17-1/2″ wide, 7 3/8″ deep (front to back). If your machine is equal to or less than those measurements, it will fit the opening.